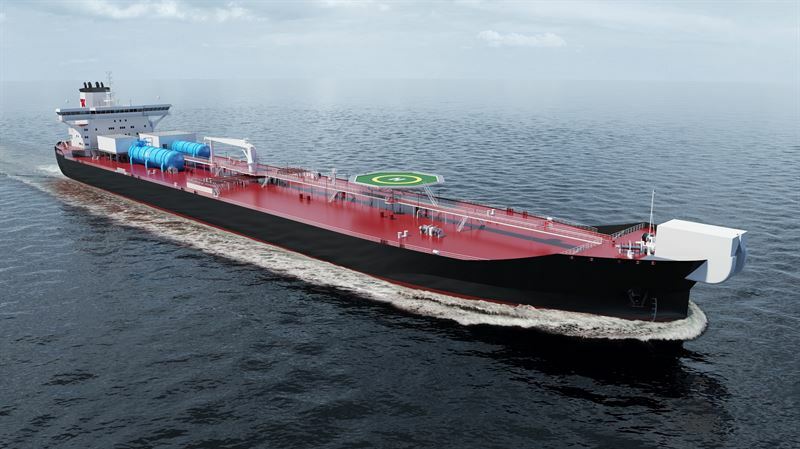 The new shuttle tanker concept creates both economic and environmental benefits for owners. The concept has been endorsed with orders for four of these ‘next generation’ vessels for TEEKAY. The ships will be built at the Samsung Heavy Industries (SHI) yard in South Korea and will feature a very broad assortment of Wärtsilä’s latest technology innovations, all of which are central to the concept’s overall performance gains. These orders with Wärtsilä, worth in total over 110 MEUR, were booked in December 2017 and January 2018. The concept offers a new level of economic and ecological performance, and is expected to reduce annual emissions of CO2 equivalents by more than 40 percent, compared to conventional shuttle tankers. In addition to operating on Liquefied Natural Gas (LNG) as the primary fuel, the dual-fuel engines will also be able to run on a mixture of LNG and recovered Volatile Organic Compounds (VOC) – the gas evaporating from the oil cargo tanks during loading. By utilising the recovered VOC as fuel rather than venting it to the atmosphere, the harmful emissions will be eliminated and the ships’ bunker needs will be significantly reduced. The concept also means that Nitrogen Oxide (NOx) emissions from the engines’ exhaust will be reduced by more than 80 percent, Sulphur Oxide (SOx) emissions will be almost entirely eliminated, while particulate emissions will be reduced by more than 95 percent. These environmental benefits are matched by equally important economic advantages, with a significant reduction in fuel consumption compared to conventional solutions. “Together with TEEKAY, we have developed a concept that takes the shuttle tanker sector into a new era, and which is further evidence of Wärtsilä’s ability to transform shipping by developing and utilising the very latest technologies. These ships will have tremendous operational flexibility with unmatched manoeuvring capability, and will achieve what all operators are striving for today, namely optimal economic and environmental performance,” says Roger Holm, President, Wärtsilä Marine Solutions. “This new shuttle tanker design will set new standards for both fuel consumption and CO2 emissions,” adds Terje Rusdal, Project Manager at Teekay. Wärtsilä solutions are at the heart of this concept. Among the many innovative features is the Wärtsilä Hybrid system, on which the power distribution will be based. The Hybrid system uses batteries for fuel savings, peak load shaving, and added overall system redundancy. This directly impacts the main machinery, resulting in fewer running hours with correspondingly lower maintenance time and costs. Wärtsilä’s broad scope in enabling this concept also comprises the full electric and automation system, which includes the Wärtsilä Low Loss Hybrid (LLH) system and batteries, the Wärtsilä LNGPac fuel storage and supply system, the Wärtsilä VOC system for recovering and liquefying the VOC with a storage and supply system, Wärtsilä 34DF dual fuel gas engines, the fuel mixing system with liquid VOC and LNG as the main fuel for the engine, gas turbines to handle the surplus gas, Wärtsilä cargo and ballast pumps and a Wärtsilä inert gas generator. This range of Wärtsilä solutions in a single vessel is indicative of the company’s extensive portfolio of products, systems and solutions, which is unmatched in the marine industry. Also included in Wärtsilä’s integrated solution for this vessel concept is Eniram’s Vessel Performance Management system. Eniram, a Wärtsilä company, will provide a data collection platform having the capabilities to optimise the vessel’s operations, while also providing the owners with analytics and reporting. The Performance Management system ensures that the full potential of the vessel as well as the fleet, will be utilised. Shuttle tankers are used for transporting oil from offshore fields to land-based terminals. Their various operational modes present significant challenges in maintaining efficiencies. The new concept has been conceived to overcome such challenges. Caption: The new shuttle tanker concept creates both economic and environmental benefits for owners. The technology group Wärtsilä is a global leader in advanced technologies and complete lifecycle solutions for the marine and energy markets. By emphasising sustainable innovation and total efficiency, Wärtsilä maximises the environmental and economic performance of the vessels and power plants of its customers. In 2016, Wärtsilä's net sales totalled EUR 4.8 billion with approximately 18,000 employees. The company has operations in over 200 locations in more than 70 countries around the world. Wärtsilä is listed on Nasdaq Helsinki.